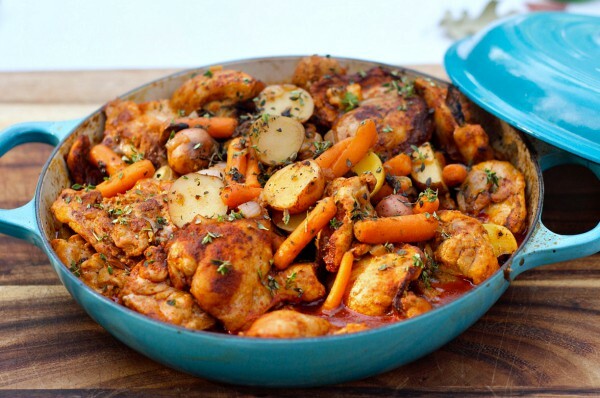 This One-Pot Paprika Chicken Thighs recipe, with potatoes and carrots, is healthy and delicious, and good enough for company! 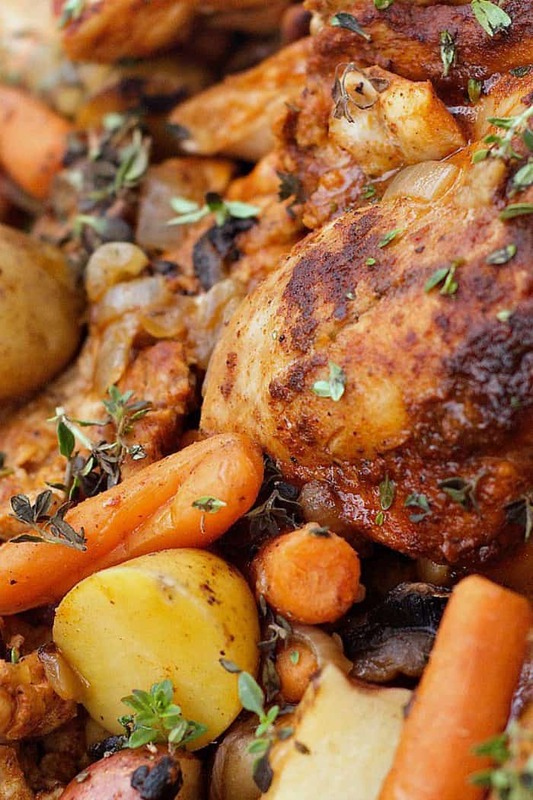 Friends, enjoy One-Pot Paprika Chicken Thighs for dinner tonight or this week! 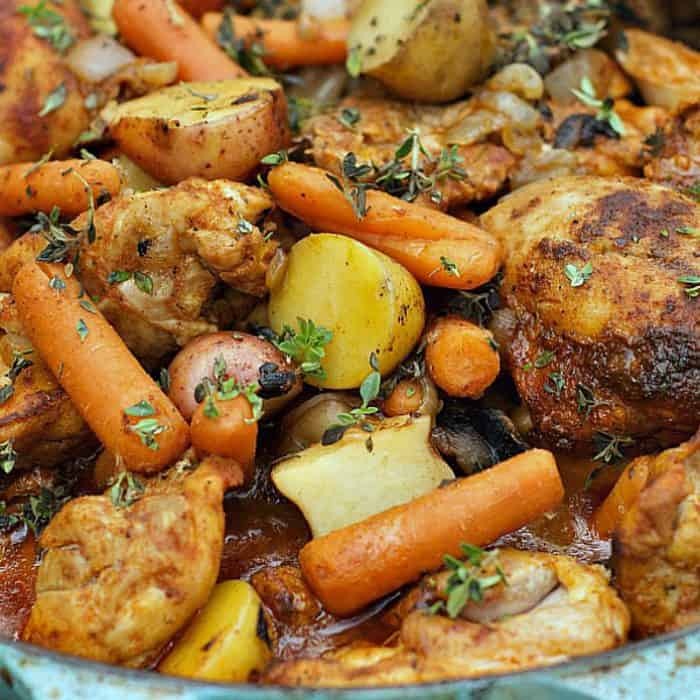 How do you cook chicken thighs in a Dutch oven? This recipe is great for leftovers, and super easy to put on your weekly menu rotation! If you’re a sweet potato lover, then you’ll really like Paprika Sweet Potatoes Chicken Thighs! 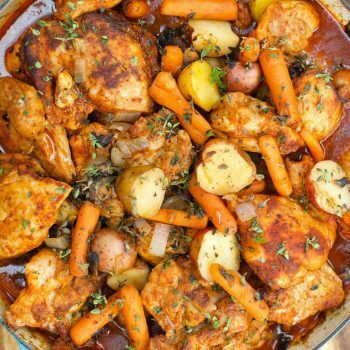 Pull out your favorite dutch oven and get ready to make your family happy! 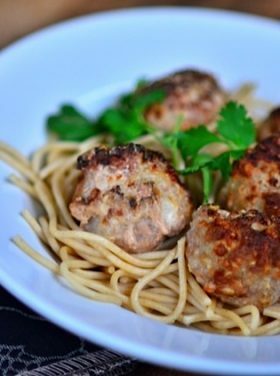 I came up with this recipe a couple years ago, and it’s now one of our family-favorites. We used fresh garden potatoes, but now that we don’t have a garden, it’s just as tasty to buy them! Is Paprika good on chicken? Paprika is delicious on chicken! You can use hungarian paprika, or regular. 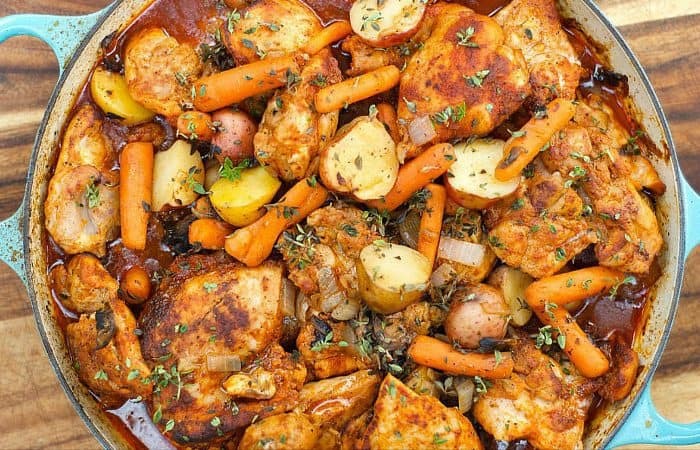 It’s so easy to make a one-pot meal, and the flavor is delish! I love a “one-pot” meal, a recipe where you put everything into one pot! 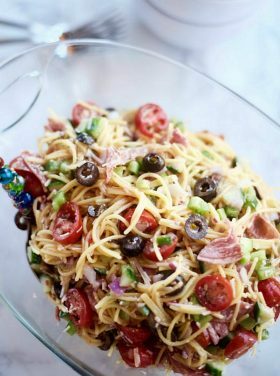 If you’re a one-pot cook, then you may also want to try The Pioneer Woman’s Perfect Pot Roast Turned into Soup or this One-Pot Sausage Spaghettini Dinner – both so good! I took one bite and thought to myself, Yum, this is fantastic! So I called one of my friends, who I know works out of the house, and asked if she wanted to swing by to “pick up dinner” from our house! She was elated, I was more than happy to practice a “random act of kindness,” and to think of how I could bless someone else. We enjoyed the dish for dinner, knowing our friends did as well. Shake the chicken in paprika, salt and pepper. Cook for a few minutes on each side. Then get going on all the veggies, adding the chicken again, white wine, stock, cooking to perfection. Then … fresh thyme at the very end. Serve it on rice, quinoa, farro, or even pasta – if you want more carbs! The sauce is that good! Readers have asked about what smoked paprika, but you can also use regular paprika in the recipe. We enjoyed it plain … well, not really plain. The juices and flavors explode in your mouth, so you really don’t need anything paired with it, except maybe a nice glass of wine. For me, cooking and sharing are more than flavor—they’re about people, community, faith, life, feeding, leading—even though wholesome ingredients are important! 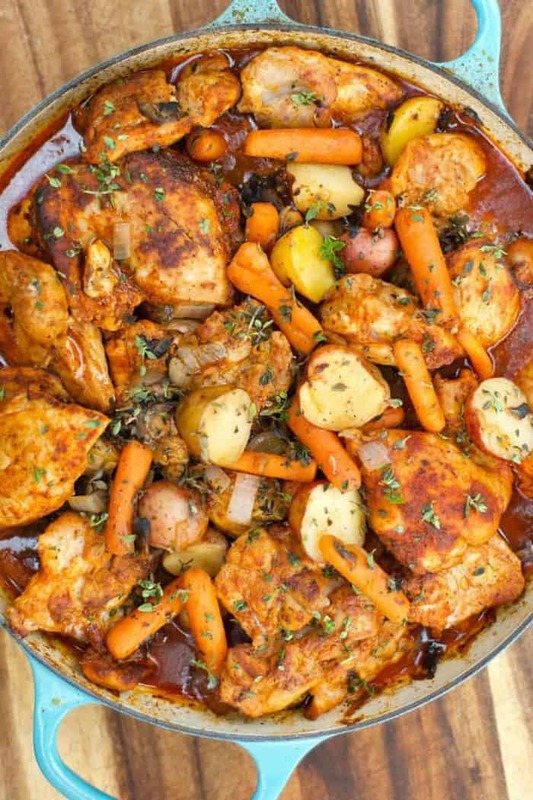 This recipe, served in my beautiful Le Creuset Braiser, is great to take straight to the table for serving. 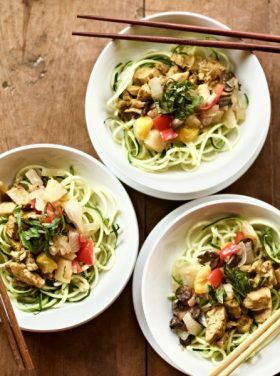 I’d like to challenge you to think differently the next time you make a large meal (maybe you’ll double the recipe, or you’ll make extra so you have leftovers) to think outside your “little box” of who could benefit from a serving or two, of the exact meal that your family will be enjoying? I’d love to hear about how YOU do it, what surprises or significant things happen when you share love+food? 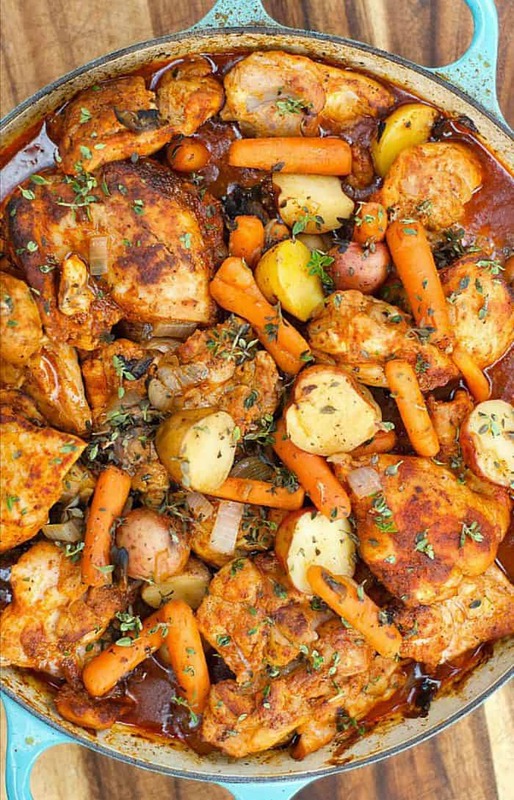 One-Pot Paprika Chicken Thighs, with potatoes and carrots, is flavorful, healthy, and good enough for company! Try it on served in rice, quinoa, or farro. You can use white grape juice in place of the white wine. In a Ziploc bag, combine about 2 T. smoked paprika, 1 tsp. each of salt and pepper. Mix together and add 4-5 pieces of chicken at a time, lightly shaking. Pull the chicken pieces out and put on a large plate. Repeat the process, adding more spices if needed, until all the chicken has been coated. Originally posted on RE September 2016. 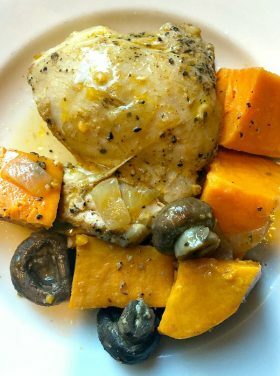 I am also a huge fan of my KitchenAid multi-cooker and Instant Pot for these types of recipes! It doesn’t have to be gourmet. 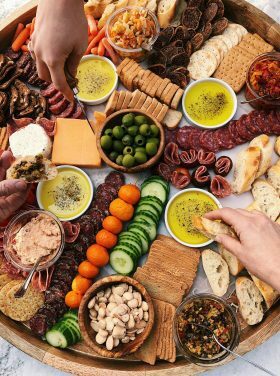 Here’s a cool concept how to eat with people from around the world. Here’s a cool Pinterest board – Make Ahead Meals for Family & Hospitality. Great concept here on simple hospitality meals – with Coconut Brownies? Yes! And I wrote this one year ago! 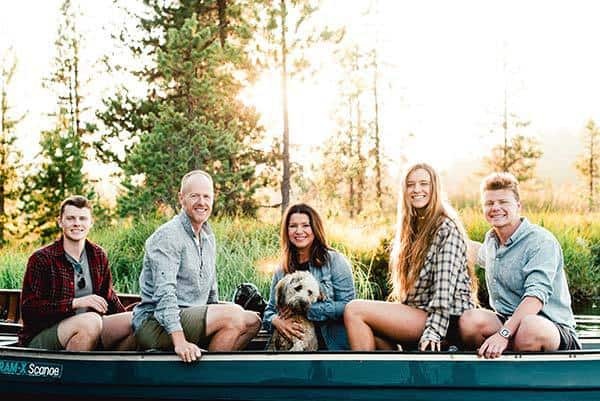 Embracing the company, within your own little family, over at The Art of Simple. 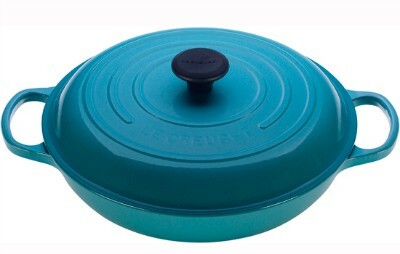 Are you interested in learning more about my 3 1/2 quart Le Creuset Braiser? Mmm, what a beautiful, delicious and comforting meal! I’ve been making this recipe for years and it is always so delicious. 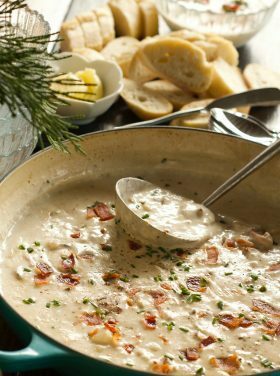 It is one of my favorite go-to dishes when guests are coming over. I made this dish this evening, but I used Hungarian Sweet Paprika for the first time with it instead of the smoked – totally changes the flavor and I actually ended up enjoying more than with the smoked. Totally recommend trying it some time! Anyway, thank you for sharing this recipe! I have made this recipe MANY times and people love it, so thank you so much for sharing! I just got an instant pot and was wondering if you knew if you could make it in that? This is my kind of dinner right here! Totally delicious! 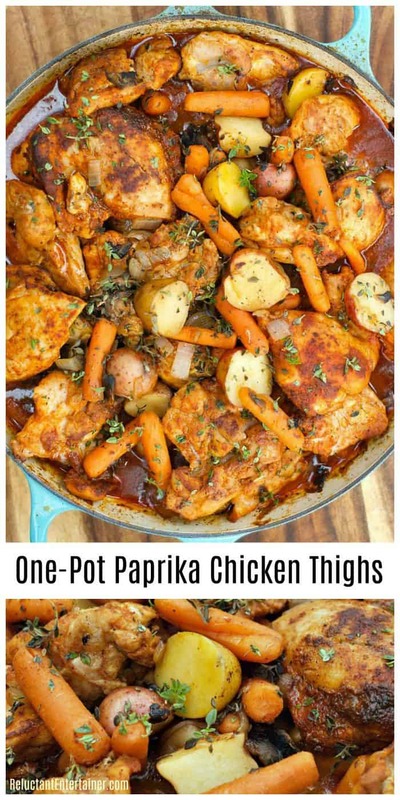 I absolutely LOVE recipes like this that use thighs AND are cooked in one pot! Hi, thanks for this recipe. Love one pot meals. Came out very good and will make again! Making this right now. Tasted the sauce. Wow too hot for me so just added some honey and tomatoe paste. Will have to cut the paprika down for us next time. Smells delicious can’t wait to dish up. Thank you for the recipe! I made this for company tonight in the crock pot and it was amazing! I served it over couscous. Im curious as to what white wines where used. Im not much of a wine person. So not sure what would be good to use. Dry white wine is the best! Made the recipe exactly as it was written, except for the carrots. I used regular carrots. What can I say – absolutely delicious !!! We loved it. Also, I love one pot dishes. We did not have any white rice in the house, so I substituted Tagliatelle. something I often serve with stew. Mmmmmm. Thanks so much for this awesome recipe! I made it this evening and my husband went absolutely nuts for it. I was a little doubtful about the smoked paprika (I prefer the flavor and smell of regular sweet paprika), but my husband just raved and raved about how delicious he thought the dish was. So bottom line, 2 thumbs up and we’ll be making this one again. Yes you can! I haven’t tried it in the slow cooker, but it will be delicious! I saw this recipe and realized I had all of the ingredients to make it tonight! I was going to halve the recipe, then I read your post and it made me think of a friend who has been ill and has needed a little help lately. I decided to make the whole batch and deliver half of it to her and her family so that they don’t have to worry about dinner tonight. Thank you for the inspiration – your good deeds are spreading! I made this tonight, but left out the wine, and used arrowroot to keep it gluten free. Ohmygoodness. Huge hit here. My entire family loved it. And to think, I’ve only used my paprika for deviled eggs!! Thank you so much! Made this recipe. Love it. A friend at work made this and gave me some. It is absolutely delicious. I’m sure I could figure it out on my own but what is the nutrition value of this meal? Thank you. I came across this recipe via Facebook and tested it over the weekend. This is so delicious! I’m a big fan of any recipe that includes Smoked Paprika and try to incorporate it in many of my savory dishes. Thank you so much for sharing. I’m glad you enjoyed, Angel! :) Thanks for sharing! We were very unimpressed with this dish. I used a decent smoked paprika and even added a little cayenne. I felt the dish had little flavor. It tasted like chicken and vegetables cooked in chicken stock. Quite common. We have a big pot of it leftover and we’re going to try and salvage it with more ingredients. Joe, how old is your paprika? I refresh my spices every other year and purchase only organic. Made this for dinner tonight and it was delicious! My 15 month old granddaughter had seconds! 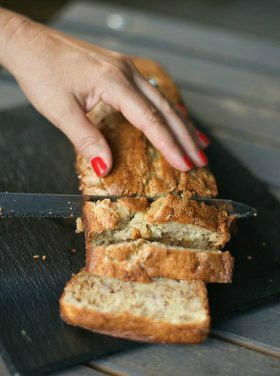 Easy recipe to follow and simple to make. Thank you for sharing the recipe. I’m making this tomorrow…how much pressed garlic would you recommend…I’m thinking two cloves? Can’t wait to try this! How big a pot should I use? Is 3.5 qt big enough? Yes! That is the perfect size! Love the video! How are all the bloggers making these? Is there a program? I work outside the home and do not get home until late most evenings. So, I love to cook in my crockpot. It is just my husband and myself at home now, so I love to share my meals with my daughter and her family. Last night I cooked a roast, potatoes, carrots and onions in the crockpot and took dinner to a friend who has just had surgery. So for me, its easy, convenient and gives me an opportunity to share a meal. Crockpots are also really good for cooking soups, stews, chilis, casseroles, and just about anything and with the crockpot liners now available, clean up is easy as well!